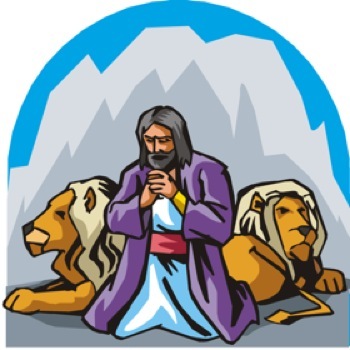 The story of Daniel in the lions den is a story about unconditional faith and complete trust in God. 1. Daniel was a young boy living in Jerusalem. 2. King Nebuchadnezzar conquered Jerusalem and took captive five thousand Israelites. 3. He chose the most intelligent, handsome and talented boys from among the captives to live at his palace and serve him. Daniel was among them. 4. King Nebuchadnezzar did not believe in the same God that the Israelites did but he learned to respect their God and fear his powers. 5. After the death of Nebuchadnezzar his son Belshazzar followed him at the throne. 6. Unlike his father, Belshazzar did not honor Daniel's God and preferred to pray to idols. 7. Later, the great empire of Babylon was captured by King Darius the Mede. 8. This new King liked and trusted Daniel but his advisers did not. They wanted to see Daniel's downfall. Knowing that Daniel will not obey, they suggested to King Darius that order that no one should pray to anyone but the King. 9. As they anticipated Daniel disobeyed the order. His enemies run to tell the King. 10. Even though the King liked Daniel, he had no choice and he had to punish him and send him into the lions den. 11. Darius was sad and tried to think of a way to save Daniel. Before they rolled the stone across the mouth of the den he said to Daniel: "May your God come to your rescue." 12. In the early morning the King run to the pit and asked: "Daniel was your God able to save you?" and Daniel replied: "God sent an angel to shut the lions' mouths." 13. Daniel's accused were thrown inside the lions den instead. 14. Darius sent a message to all four corners of his empire commanding his subjects to worship the only God whose hand could muzzle a pride of lions. 1. Complete Devotion - Daniel was captured and taken away from his home. He worked as an adviser to three different Kings but he continued to believe and remained devoted to his God. He practiced his faith and prayed. Our faith can never be taken away from us. 2. Unconditional Faith - Daniel lived in the palace and enjoyed a life of abundance. But Daniel did not lose his faith in God during difficult times. Daniel's faith was stronger when he was in the lions den. When times are good we tend to have an easier time believing in God but we must remember that God is by our side in good times and in bad times.